Your dentist in Federal Way has a sharp eye and can often spot oral health problems through a basic visual examination. However, even the best dentists can’t see everything without a little help. That’s why our practice uses the latest technology to diagnose issues when they’re in the earliest stages. Let’s talk a bit more about the gadgets that we use to protect your smile. X-rays have been around for over a century, but the X-rays we use today aren’t the same as the ones that were common decades ago. Thanks to scientific advancements, we now have digital X-rays at our disposal. They use an extremely small amount of radiation (they’re super safe), and the images go directly into a computer so we have instant access to them. 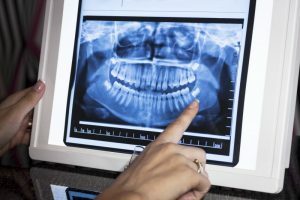 We recommend that most patients get a set of X-rays done at least once a year. This will allow us to look for any problems that might be developing beneath your gum line or in the tight spaces between your teeth. We may identify cavities, issues with your wisdom teeth, infections, or other problems that could endanger your oral health. Sometimes, cavities are so small that not even your dentist can spot them with the naked eye or even with a dental explorer tool. That’s why we use DIAGNOdent, which uses a laser to pinpoint weak spots in your teeth. It highlights areas that need treatment right away or that may need restorative treatment in the future. DIAGNOdent is so valuable because it allows for the earliest possible detection of decay, and the earlier we know there is a problem, the easier it is to fix. Did you know that roughly 50,000 people get diagnosed with oral cancer each year? It certainly isn’t the most common cancer, but it is a major concern, especially for folks with certain risk factors, such as HPV or tobacco use. It’s recommended that adults get screened for oral cancer at least once a year, and while a tactile and visual examination is the standard screening method, there is a better way. VELscope highlights soft tissue abnormalities that could easily be missed during a regular screening. It’s a painless and quick way to find out if you have any spots in your mouth that might be cancerous. We want you to understand your oral health and be an active participant in looking after your smile. Therefore, we use intraoral cameras. One of these small handheld devices will project images of the inside of your mouth into a nearby screen, making it easy for you to understand any concerns your dentist has about your teeth and gums. At your dentist in Federal Way, we’re proud of the diagnostic technology we use, but we’re even more proud of the high level of service and care that we offer to our patients. We invite you to come in and learn more about how we aim to safeguard your smile. Dr. Drew Beaty is one of the top dentists in the greater Seattle area. He combines technology with his experience and passion for improving his patients’ lives to deliver the best experience possible to the folks who come into his office. If you have questions about our practice or would like to schedule an appointment, please contact us at 253-839-6544.